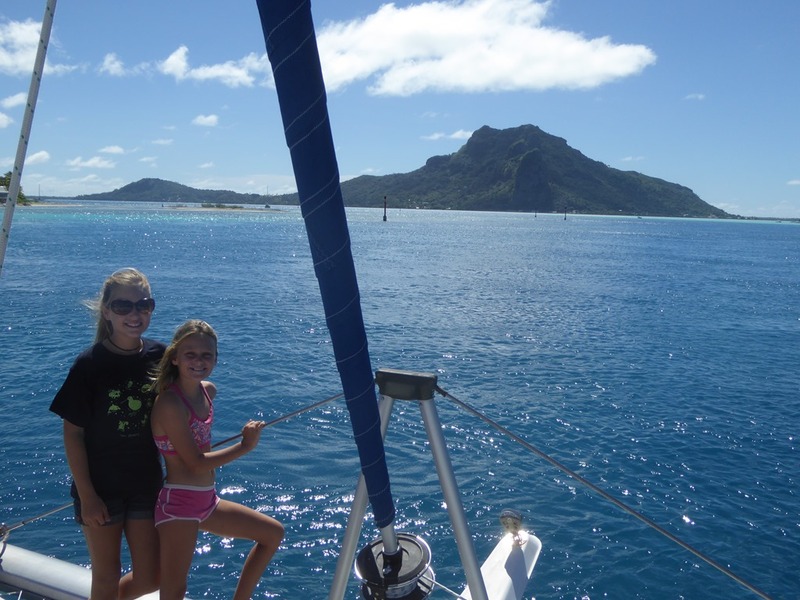 We had a lovely sail across to Maupiti. 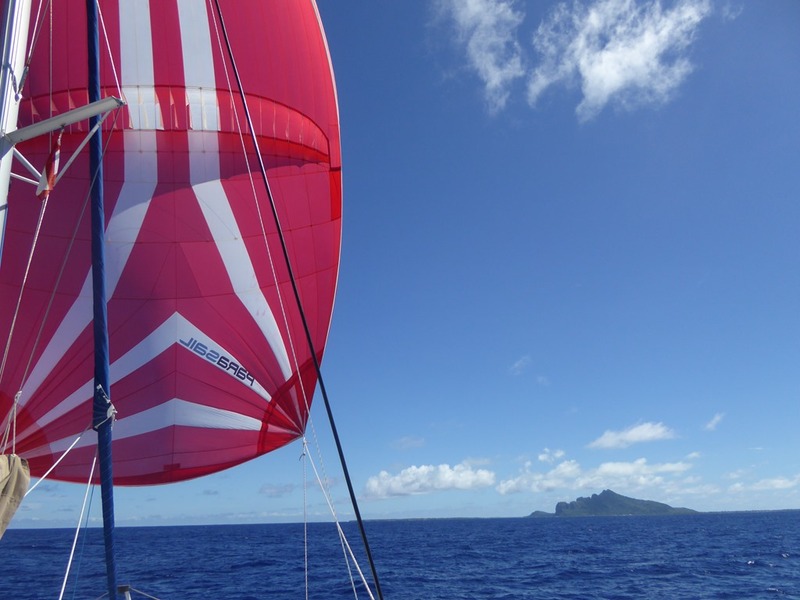 Blue sky, favourable and light winds meant a pleasant day sail. 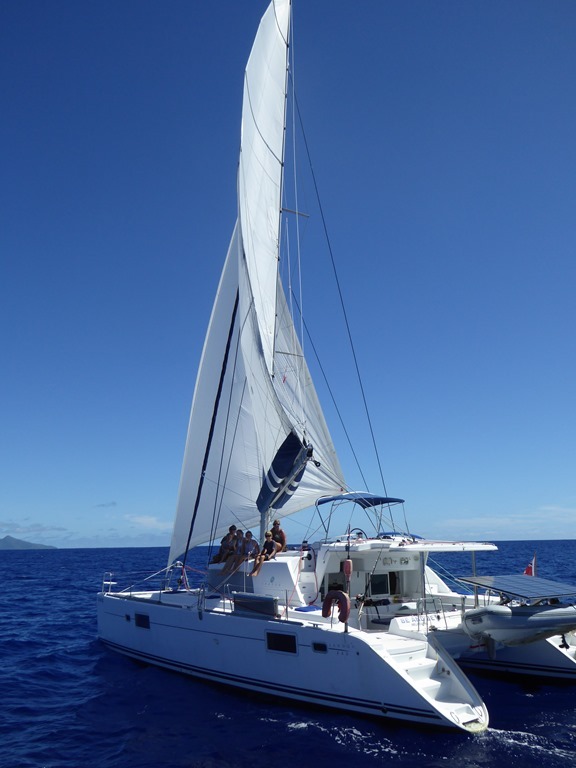 With our new sails up, we dondered along, just about keeping station with Be and Be. 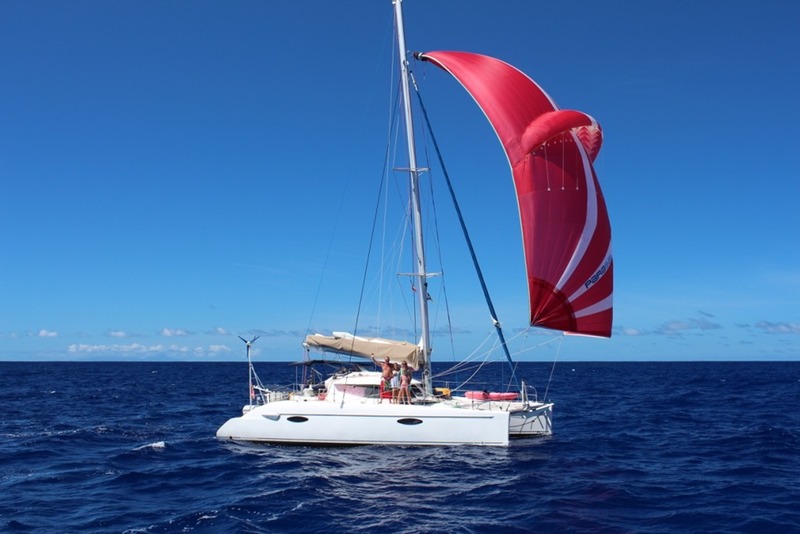 As the broad reach became a run, we ditched the white sail and flew the parasail. Such an easy sail once it is up. 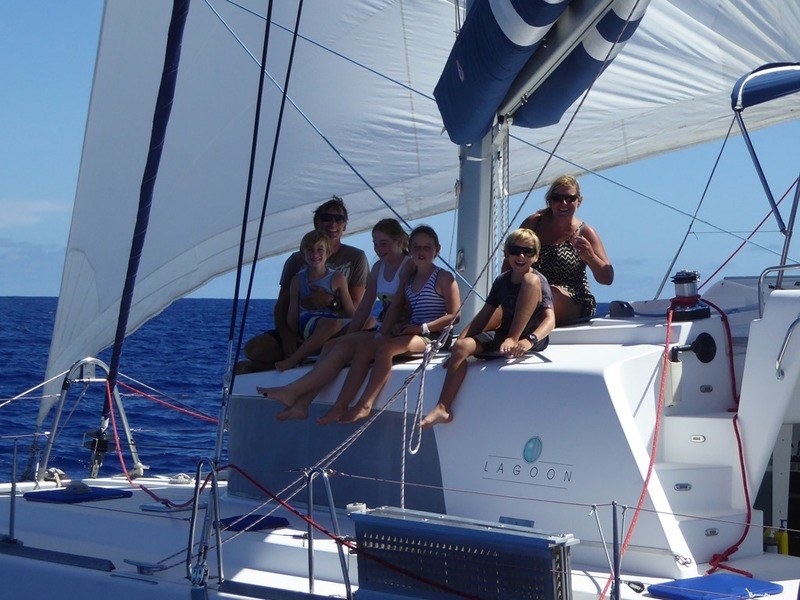 We caught up with Be and Be, had some very close sailing in company and got some great photos of the boat and her crew. 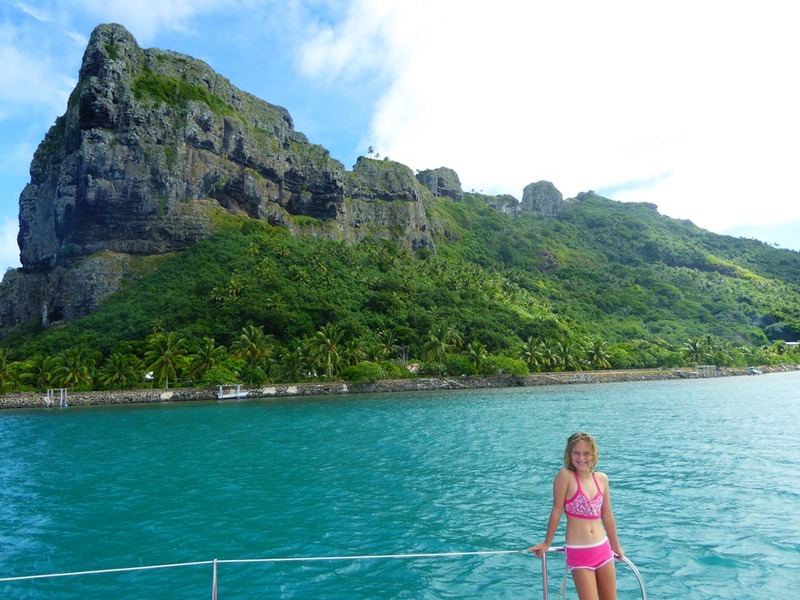 The entrance pass to Maupiti on the SE corner of the reef is very cheeky and the boat actually surfed on one wave just as we went past the edge of the reef. Not a pass for the fainthearted. The guide books tell of big surf and of boats getting stuck here for weeks at a time with unpassable seas breaking across the less than 75m wide entrance. It is obvious to see why. Even on a quiet day there was a 3m surf only 20m either side of us. God knows what it would be like when the weather kicks up. For us, we know that there is strong SE winds coming in on Tuesday afternoon which we intend to use to spring W. We will be making sure we leave before that affects the pass. We pushed through 3-4knots in the narrow channel and anchored at 16 28.339S 152 15.024W in about 10m of water. 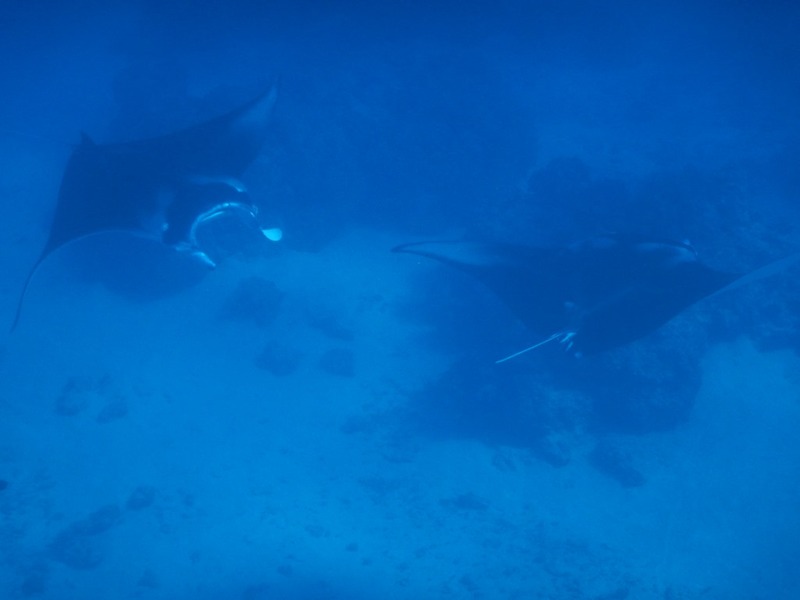 As soon as we dropped we had two big Mantas go past us! Thank you, Cathi and Wolfi, for the steer to this place. Just to our E there is a protected area marked by four buoys prohibiting anchoring. 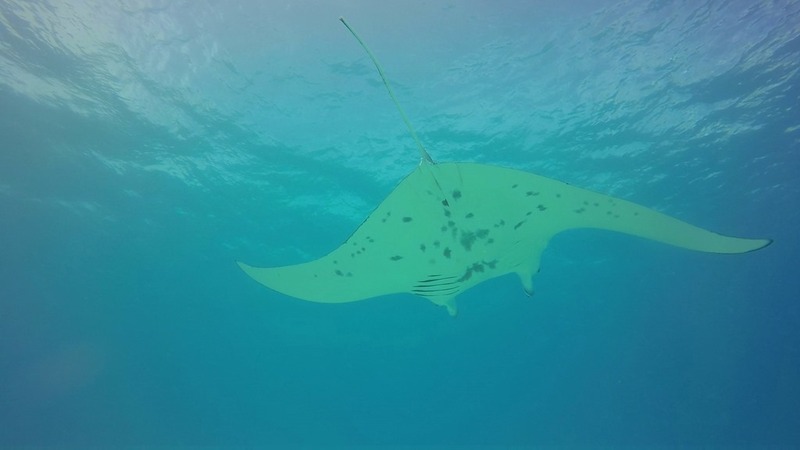 The area is known to be a favourite of Manta Rays and the main reason people visit this island. The Manta use it as a cleaning station. We watched with some amusement as a charter boat actually tried to pick one of the buoys up before realising their error! It was good to watch a near perfect sunset with a clear sky and unimpeded view of the horizon. The next morning Be and Be was asked to move as although their anchor was outside the protected zone, she had swung into it when the wind changed from an E to a N overnight. A local dive boat went back and forward then threw down an anchor. 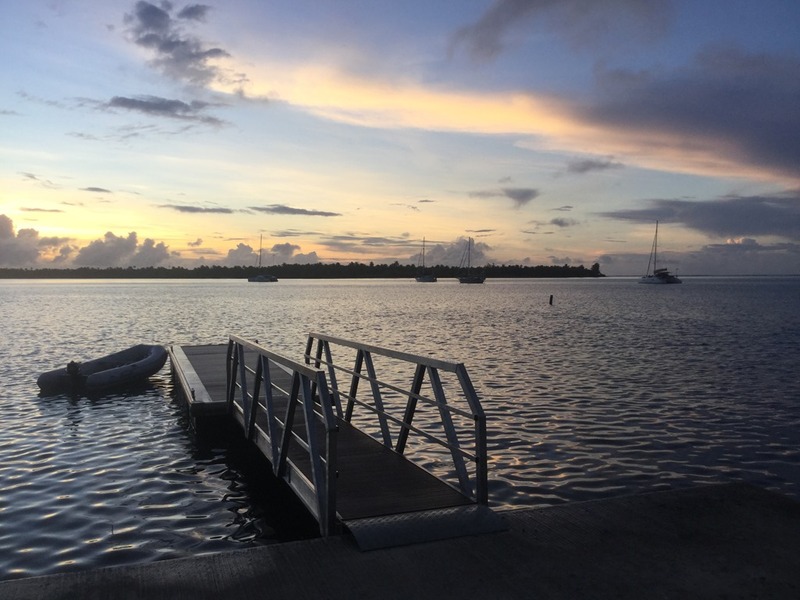 We jumped in to the dinghy and then set ourselves to drift down towards the dive boat. 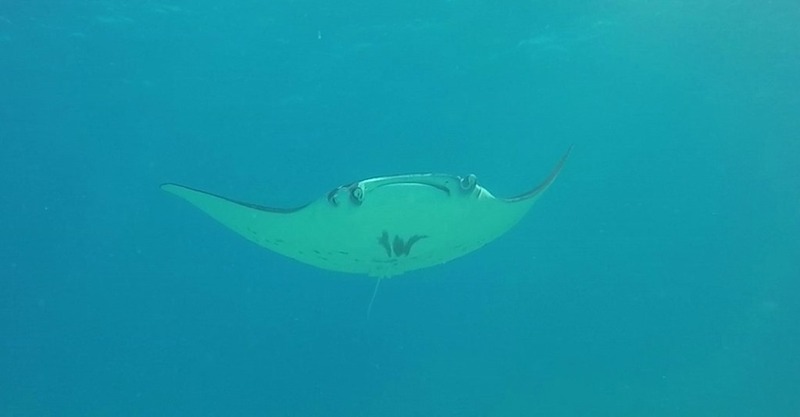 We were rewarded with five Manta, the largest of which was about 4m across. 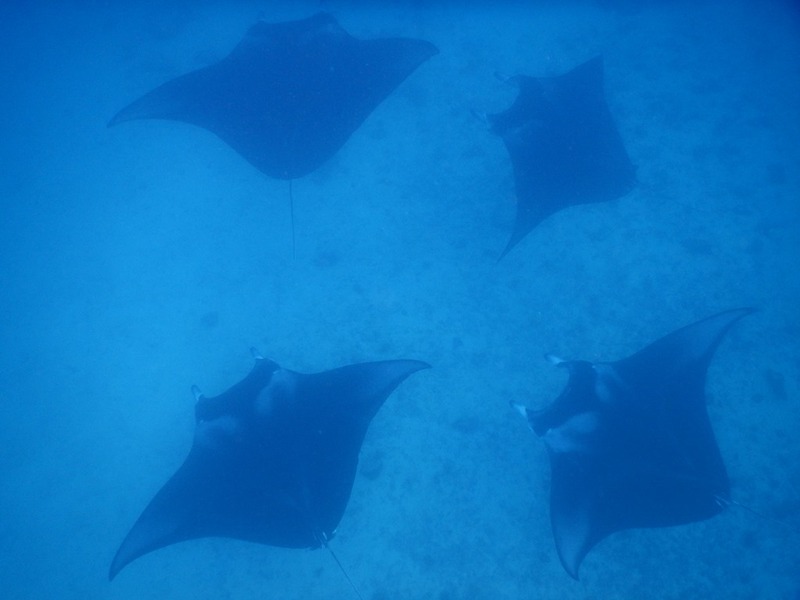 Although the visibility of the water wasn’t great, watching these gloriously languid beasts was a fantastic experience. They spent their time circling a couple of the bombies. We spent the afternoon getting ourselves ready for the crossing, allowing the kids time with each other. 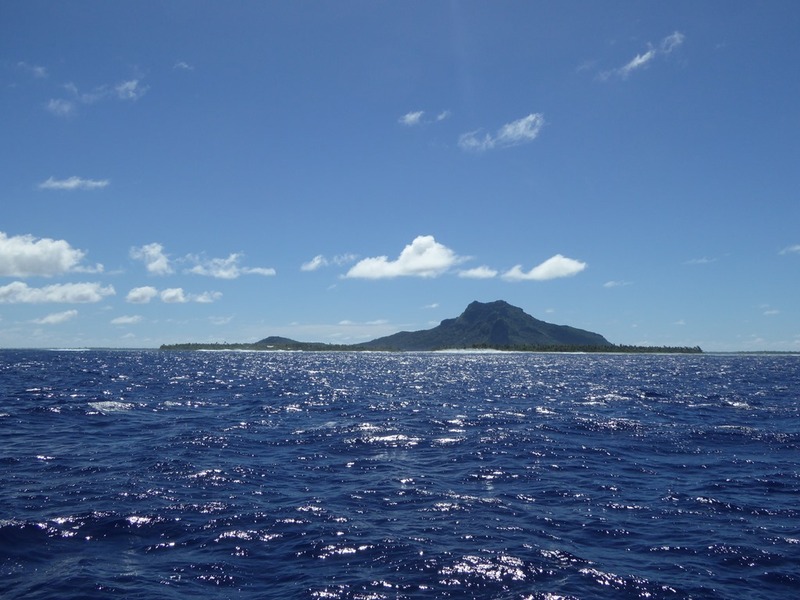 We gave the watermaker a long run and did some tidying away of the toys that we had out during our Bora Bora fun time and the cabin became a little less full of girls’ bits and pieces. The next day Eleanor and I decided to dive where we had snorkelled before. 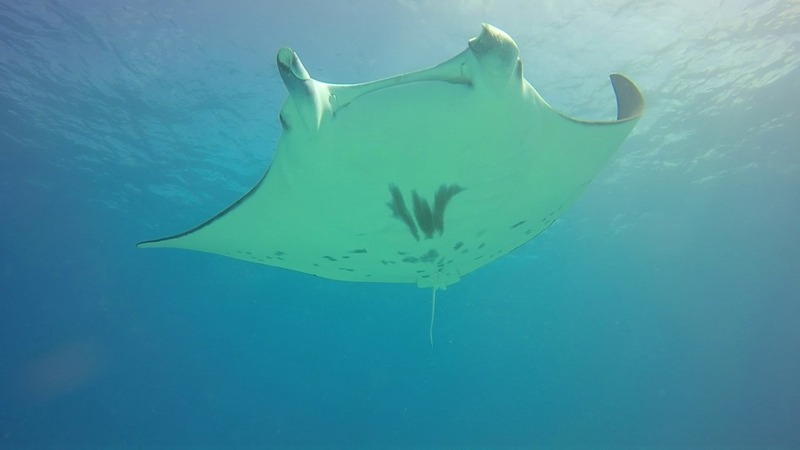 The rest of the crowd watched above us as three Manta came to the cleaning station and hovered overhead and within touching distance of us for about half and hour. They were amazing. Two smaller 3m wide ones were with us throughout and we were joined by a 4+m one for a few minutes too. Eleanor’s eyes were glowing as we watched them circle us. The advantage of being down on the bottom was we were able watch them open their gills to allow the smaller fish in to clean them. It was amusing to watch the Manta twitch as a cleaner took a nibble of something it shouldn’t have! With the weather just a day away, we moved up to the village and anchored in 15’ of water at 16 26.911S 152 14.757W straight off the church, by far the largest building here. Geoff and I had a last chat about the weather, deciding to push off early the next morning to make sure we are out of the pass before the SE swell arrives. An USA boat, Flying Cloud, a name I knew from the Poly Mag Net was also waiting for the weather and agreed with our assessment of it. Typically island like, the post office was closed for Labour Day (they do like their holidays here) and therefore the internet had been switched off too. Our last night was spent quietly by ourselves. I was up early on our last morning to get bread. You will find the boulangerie at the main jetty under the huge edifice at the S end of the island. It was a pleasant 15min walk from the dinghy dock at the post office through the village. I was served by a long silver haired French émigré with a big smile and a dead, well chewed half rollup hanging out of his mouth. But the bread smelt wonderful! 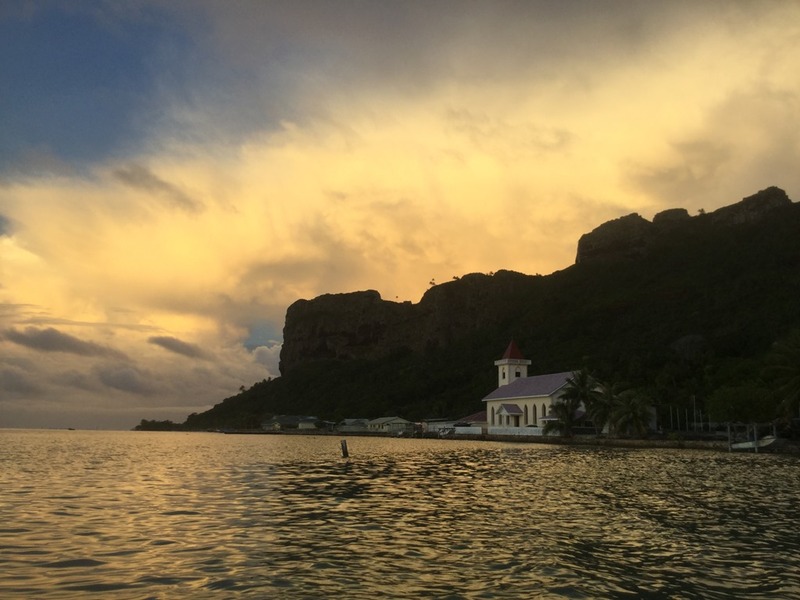 I walked back just in time to catch dawn, our last in French Polynesia, at the dinghy dock. 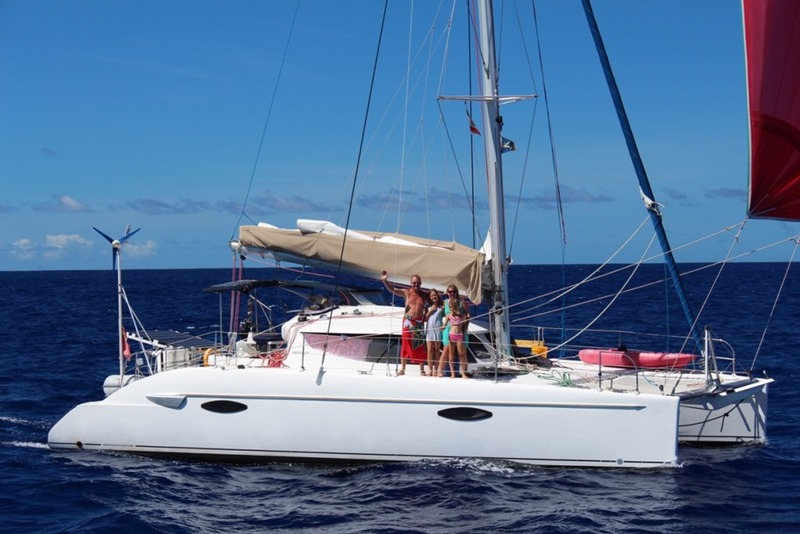 After an early breakfast, we visited the magasin, dropping off our last empty crate of Tahitian beer and came away with some bits and pieces, mainly crisps, chocolate and snacks for hosting, trying to use up the last of the XFP we had on board. We tried one last time to get a call to Delorme but the internet was just too slow. 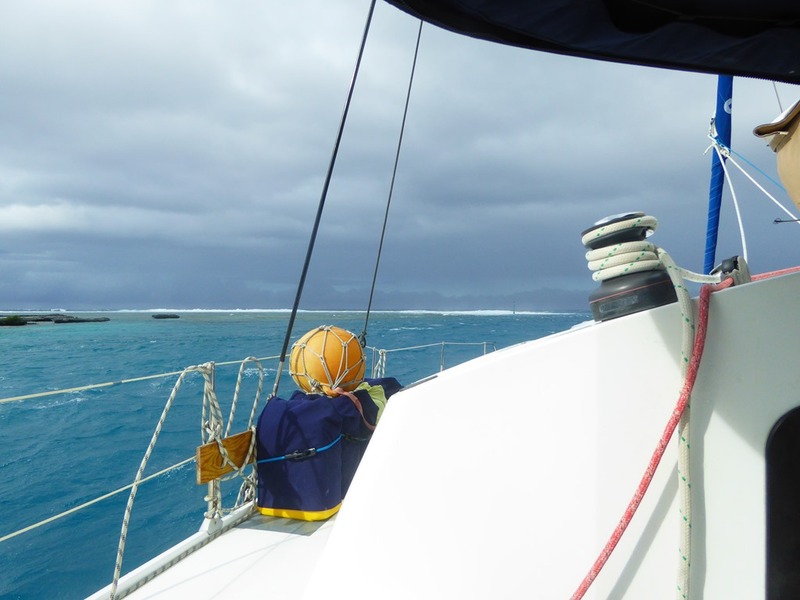 By about 0830hrs the wind had veered, earlier than we had expected, and was coming out of the S. We rushed back to the boat, pulled up hurriedly and headed for the pass. The pass was already interesting. Although the SE wind was no more than 15kts, we were faced with a line of close packed 5m standing waves and surf across the pass entrance. WTF?! 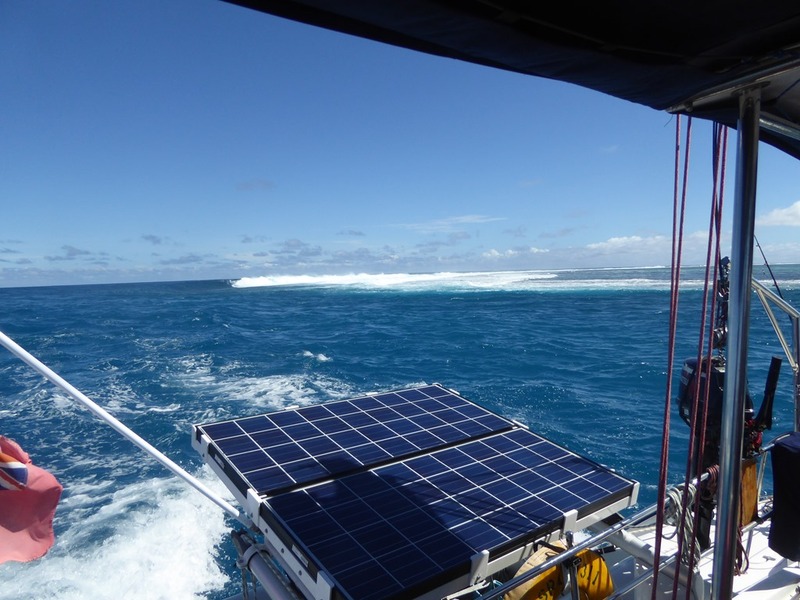 Thankfully there is always an outgoing current here so whilst we got shaken up a little we were soon able to turn out of the race, close to the surf line on the S edge of the island. With the main already up, we pulled foresail out and got sailing. Be and Be followed us out and got a bit more bounced about as the waves strengthened, just 10 minutes behind us . We spoke later to Flying Cloud who had decided to leave a couple of hours after us and they got hammered. As he put it, their 44’ heavy long keeled boat was stood on its end twice by huge standing waves and they got very worried. It was by a long way the worst pass they had ever been through. The wind was only just getting up to 20kts. We saw 30kts on the clock within a few hours of leaving. We decided that no-one would be getting out or in behind him, not for days. 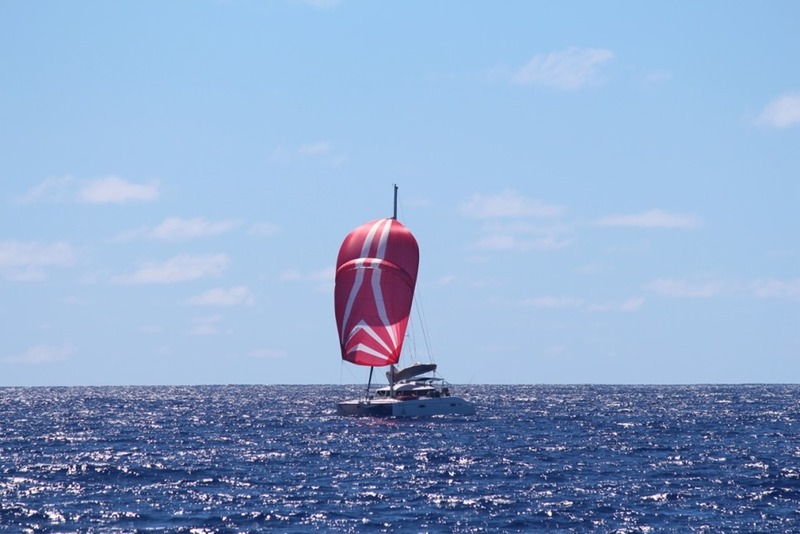 With the new sails looking good, big seas running and half a gale of wind behind us, we took off W.